Rowan Alexander Barrett Jr., professionally known as R.J. Barrett is a Canadian college basketball player. He plays for the Duke Blue Devils of the Atlantic Coast Conference and the Canadian national team. He plays in the shooting guard position and wears shirt number 5 at the Duke. He is the 2018 Gatorade National Player of the Year and 2018 Naismith Prep Player of the Year. He has over 774k followers on his Instagram. No. 2 Michigan State ended No.1 Duke's season defeating them 68-67. Duke could not make it to the Final Four after suffering a loss to the Michigan State. Duke's Barrett and Williamson could not do more to make it to the final four. Barrett missed the crucial free throw near to the end that cost Duke to advance to final four. Barrett had 21 points, 6 assists, and 6 rebounds. Winston displayed spectacular performance for the Spartans with 20 points and 10 assists. Michigan joined Virginia, Texas Tech, and Auburn in the Final Four. - Named MVP at the 2017 FIBA U19 Basketball World Cup and Gold Medal for Canada. - Naismith Prep Player of the Year and Gatorade National Player of the Year in 2018. R. J. Barrett was born on 14 June 2000. His birth name is Rowan Alexander Barrett Jr. He was born to a father, Rowan Barrett, and a mother, Kesha Duhaney. Barrett's grandparents were Jamaican, whereas his mother is a native of Brooklyn, New York. He belongs to Black Ethnicity. His birth place is in Toronto, Ontario in Canada. He holds Canadian nationality. He has a younger brother named Nathan Barrett. He showed interest in basketball in his childhood. He spent time in France where his father was playing professional basketball. While in France, he attended a French school. He had lived in several countries due to his father's basketball career. Rowan Barrett ended his professional career and finally settled in Mississauga, Ontario. He attended St. Marcellinus Secondary School in Mississauga, Ontario. He earned recognition while playing at St. Marcellinus. He played soccer, 100 meters sprinting, and the high jump while in high school. He started focusing on basketball instead of soccer at the age of 12. He told his father that he wanted to be an NBA All-Star and make the Basketball Hall of Fame in the future. He became one of the best under-12 players in Ontario. He led his high school team to a city title at the Horizon Jeunesse and was named most valuable players (MVP). He also played for the Regional Elite Development (REDA) U12 program on the Amateur Athletic Union (AAU) circuit. He was identified as one of the best players of his age by the Ontario Basketball Association. He trained with the Canada Basketball junior academy and competed for the Ontario provincial team. He attended a French-language school, Ecole Secondaire Jeunes San Frontieres in Brampton. He started his high school basketball career at St. Marcellinus Secondary School. Despite being in his first year, he was labeled "special" by the Canadian recruiting website Nort Pole Hoops. He was named MVP of the Guy Vetrie Memorial tournament in February 2015 after scoring 41 points for REDA against BTB Academy. He was invited to the Regional of Peel Secondary Schools Athletic Association (ROPSSAA) all-star game in April 2015. He was recognized as the best prospect in the ROPSSAA. He then transferred to Montverde Academy in Montverde, Florida. He led Montverde Academy in scoring in his freshman years. He was named to the MaxPreps Freshman All-American First Team. He was one of the 20 players to be named to the USA Today High School Sports All-USA Preseason Team. He received the tournament MVP honors after scoring team-best 15 points in the finals against Memphis East High School. He scored 21 points in January 2017 and helped his team to win the Spalding Hoophall Classic. He earned MVP honors at Basketball Without Borders in February 2017. He joined the World Select Team at the 2017 Nike Hoop Summit. He finished his sophomore year averaging 22 points and 7 rebounds per game. He was tabbed National Sophomore of the Year by MaxPreps. He also made the Naismith All-American Third Team. He scored 26 points in the 2018 McDonald's All-American Boys game in March 2018. He was awarded the prestigious Morgan Wooten National Player of the Year award in March 2018 for "displaying outstanding character, showing leadership and embodying the values of a student-athlete". He led the undefeated Montverde team to the Geico National boys' basketball championship in the 2017-18 season. He scored 20 points, 9 rebounds, 6 assists, and 5 steal at the 2018 Nike Hoop Summit. In the end, he was named MVP. At the end final years at Montverde, he was named Prep Player of the Year and Gatorade National Player of the Year. He was tabbed as the top Canadian prospect in the 2019 class. He received scholarship offers from several major universities including Arizona, Duke, Kansas, Kentucky, Missouri, Oklahoma, Oregon, Texas, UCLA, and USC. He committed to attend Duke. He posted 33 points and 6 assists against Kentucky at the Champions Classic making the Duke freshman scoring record in a debut. He posted 23 points, 11 rebounds, and 10 assists in a 94078 win over North Carolina in February 2019, which was the fourth time in Duke history. He was named in Sporting News' All-American First Team and the All-ACC First Team at the end of Duke's regular season. He posted 26 points and 14 rebounds in an 85-62 win over North Dakota State in the NCAA Tournament. He was the youngest player on Canada's U16 national team. The team won the silver medal at the 2015 FIBA American U16 Championship. He averaged 18.4 points, 4.6 rebounds, and 2.3 assists per game at the 2016 FIBA U17 World Cup. He was named to eurobasket.com's All-World Cup U17 Second Team. He made headlines when he posted 30 points, 13 rebounds, and 5 assists in the semifinal against the US at the FIBA U19 Basketball World Cup. He helped Canada to win FIBA U19 Basketball World Cup defeating Italy in the final. He was the leading scorer of the tournament averaging 21.6 points per game. He was named to the tournament's All-Star Five and also the tournament MVP. He made his debut for the senior team against China in June 2018. He scored 16 points in a 97-62 win. 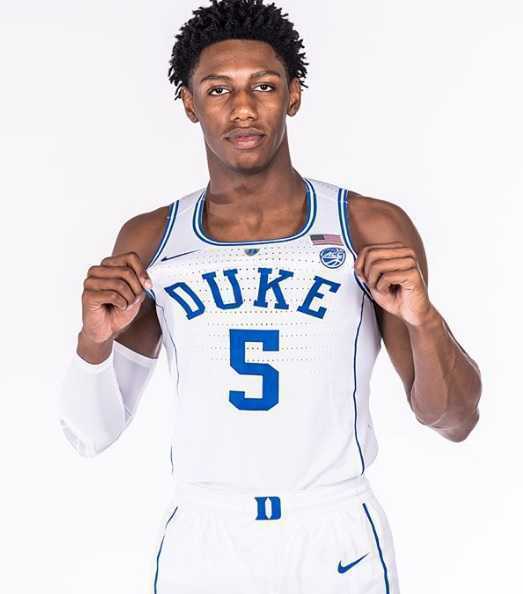 Who is RJ Barrett Dating? RJ Barrett is reportedly single. He might or might not be dating anyone at present. He is very young. He is focused on to his college basketball career at Duke. No information regarding his affairs has surfaced yet. What are R.J. Barrett's Body Measurements? R.J. Barrett stands at a height of 2.01 m i.e. 6 feet and 7 inches tall. He has a body weight of 202 lbs i.e. 92 kg. He has an athletic body build. He has dark brown eyes and his hair color is black. 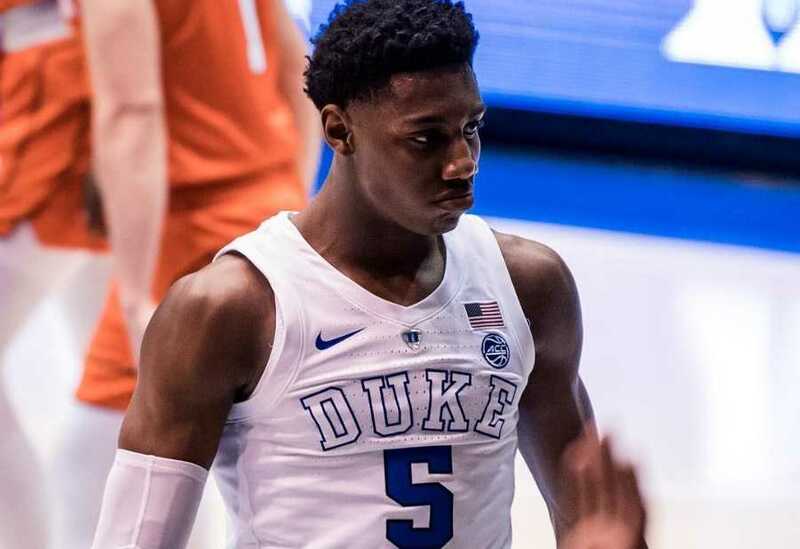 What is RJ Barrett's Net Worth? RJ Barrett has yet to play professional basketball. He has an aim to play basketball in the NBA. He has dreamt of becoming an NBA All-Star and making the Basketball Hall of Fame. He is one of the top prospects from Canada. Once he enters the NBA draft, he will surely be receiving lucrative contracts in the near future. As of 2019, his net worth is under evaluation. Her mother was a nationally ranked sprinter and long jumper. She later started working for the Canadian Imperial Bank of Commerce. He has trained with his godfather, Steve Nash on several occasions. Steve is the Basketball Hall of Fame inductee. His maternal aunt Dahlia Duhaney was a member of the Jamaicaan 4*100 m relay team that won a gold medal at the 1991 IAAF World Championships. His grandparents ran track for the Jamaican national team. His father captained Canada national team at the 2000 Summer Olympics and later became executive vice president and assistant general manager for Canada Basketball.